Earlier this month, conservationists working in South Africa's Hluhluwe-iMfolozi Park were very suprised when they reviewed photos snapped by their camera trap. Images revealed a mongoose-like genet hitch-hiking on the backs of at least two different species of animals — behavior never seen in the mammal. Zoologists have observed cowbirds riding on the backs of cattle to pick off their parasites, along with egrets grazing on the tiny creatures that collect on wildebeest. But mammals riding on the backs of other mammals? Not so much. At least not outside of humans and their domesticated animals. That's what makes this recent discovery so unique. This series of photographs depicts a large spotted genet on top of two individual buffalo. One of the buffalo seemed to be unimpressed with the genet and can be seen turning around and thus shaking the genet off. The other buffalo was quite content to let the genet "tag along" for an evening stroll. 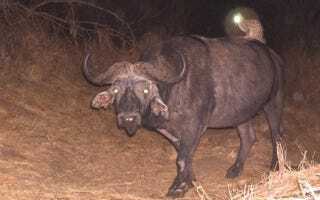 The genet seemed to have spent this particular evening riding buffalo! What's even more bizarre is that the same particular genet has a habit of hitch-hiking on other larger beasts and this rhino seemed an ideal taxi service one evening! He decided to jump on this rhino on the very same night that he was seen riding on the back of two separate buffalo. The camera traps documented the genet riding on the back of the rhino over the course of several nights. This wasn't just an isolated incident or two. Prior to this, the conservationists had never seen or heard of all these species being together. The images have stumped them and the conservation volunteers (Wildlife ACT assists Ezemvelo KZN Wildlife to monitor endangered and priority species in Hluhluwe-iMfolozi Park).